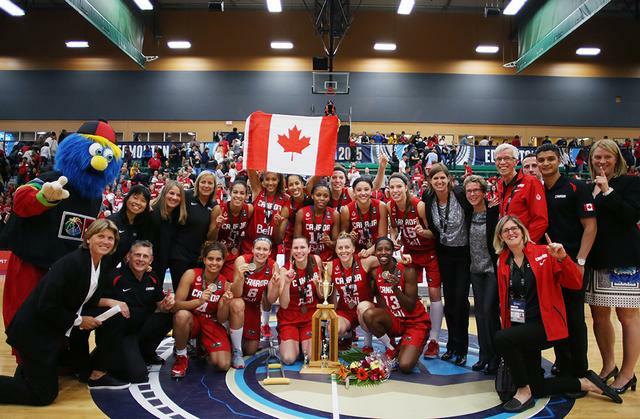 EDMONTON (2015 FIBA AMERICAS WOMEN’S CHAMPIONSHIP) – Host team Canada successfully completed an undefeated 2015 edition of the continental championship by defeating previous champ Cuba by the score of 82-66 in the Gold Medal Game. The Cubans were tough and were able to compete with the hosts, but in the end the depth of Canada, led by Kia Nurse, Tamara Tatham and Miah-Marie Langlois was more than enough to win the team their second gold medal in the history of the FIBA Americas Women’s Championship (had won the gold in the first-ever edition in 1995). • Turning Point: Cuba had opened the second-half with a 12-5 run that gave them a one point 50-49 lead with 5:19 to go in the third quarter when point guard Ineidis Casanova was called for an unsportsman-like foul that stopped their rhythm. Canada went on 14-2 run after the call. • Stats don’t lie: Canada ended up with 4 players scoring in double figures, while also dominating the rebounding battle 34-23, including 8 (4 offensive) from Katherine Plouffe off the bench. • Game Hero: Kia Nurse scored 20 points in the final and was named MVP of the 2015 FIBA Americas Championship. She headlined an All-Star Five line-up that includes teammate Tamara Tatham, Clenia Noblet and Yamara Amargo (Cuba) and Melisa Gretter (Argentina). • The Bottom Line: Canada was perfect in this 2015 FIBA Americas Women’s Championship. Unbeaten, the team led the competition in points, rebounds, as-sists and field goal percentage. This is their second gold medal in the history of the competition, having won the gold in the first-ever edition in 1995.